Q: How can the prisoners tell, with certainty, that all 26 of them have visited the central living room with the light bulb. 26 prisoners are in solitary cells, unable to see, speak or communicate in any way from those solitary cells with each other. There’s a central living room with one light bulb; the bulb is initially off. No prisoner can see the light bulb from his own cell. Everyday, the warden picks a prisoner at random, and that prisoner goes to the central living room. While there, the prisoner can toggle the bulb if he or she wishes. Also, the prisoner has the option of asserting the claim that all 26 prisoners have been to the living room. If this assertion is false (that is, some prisoners still haven’t been to the living room), all 26 prisoners will be shot for their stupidity. However, if it is indeed true, all prisoners are set free. Thus, the assertion should only be made if the prisoner is 100% certain of its validity. 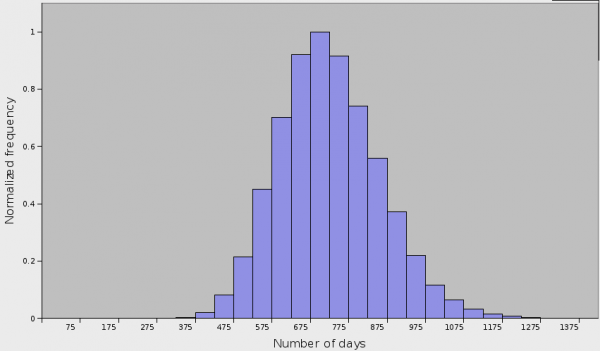 I won’t explain the solution in words as that might ruin it if you were planning on figuring it out, instead I have posted some python code that calculates the probability of number of days it will take. While perusing the statistics of wordcube, I was wondering how many 9 letter words have multiple anagrams (using all the letters in a single word) and what was the maximum number of anagrams. So I wrote a quick and dirty python program to find out. I will first show the results as they are interesting followed by my coding and methods to improve the efficiency of it. Firstly I created a dirty program that created a loop to cycle through the 9 letter word dictionary and another loop nested inside to check against every word in the dictionary again. This is a terrible and inefficient method and will create duplicates, I will follow with a more efficient method. This program took 80.42s to find the 12 solutions. On the path to better coding I decided to load the dictionary into memory, this sped the code up about 20s to 63.88s. I then attempted to create a method that loops over and removes words from the dictionary as it loops, however I don’t know the correct way (if there is one?) of modifying the loop variable while inside the loop without causing problems. If anyone knows a good method of doing this please let me know! I did managed to hack together something using slices so that I could modify the dictionary each time, however I imagine this is still quite inefficient. Even so this method now avoids duplication of results and completes in 31.87s (machine running at 3.15Ghz). Please let me know of any improvements you think can be made and I’ll happily benchmark to see how much better it is. Using graphics cards to hand massively parallel tasks can now be realised in python, thanks to PyCuda a module for python which allows interaction with the CUDA libaries/binaries provided by Nvidia. To get this working in ubuntu 10.04 lucid lynx I followed this guide http://wiki.tiker.net/PyCuda/Installation/Linux/Ubuntu. You should now be able to run the hellogpu.py demo in the examples folder and use the download-examples-from-wiki.py to download further demos from the pycuda wiki. When transferring information or settings between computers and programs is is useful to use something simple and program independent. For a recent project I need to send a settings file between a PHP script and a python program, I needed something that would support trees so an INI file was out of the question, and I naturally thought of using XML, however when looking for more information I stumbled upon YAML (seemingly forgotten alternative to XML). YAML is a recursive acronym that stands for YAML Ain’t Markup Language and below is a simplified example taken from the YAML site. The layout is similar to python with indents representing the nested layers. Semicolons are used to seperate variable names and value pairs. To use YAML in python you will need the PyYAML library avaliable here or in via your package manager in linux. (I.E. “sudo apt-get install http://pyyaml.org/wiki/PyYAML” in ubuntu/debian). We can now access all the information in the file very easily (I.E. settings[‘name’] will give us the name Joe Bloggs). YAML supports much much more than what is discussed here and further information can be found on the YAML website. 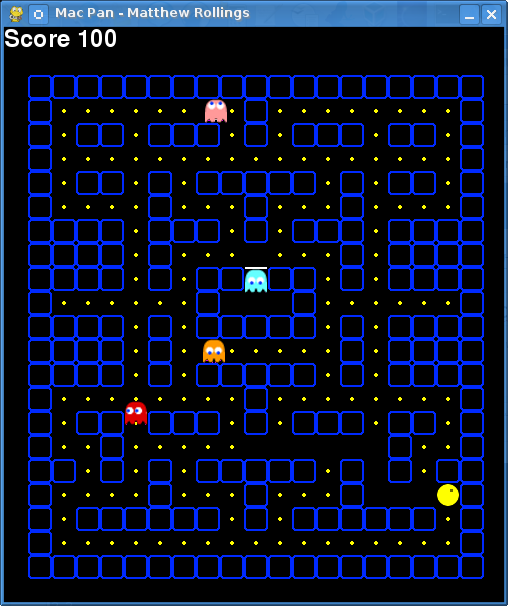 A while back I followed a few tutorials on creating a pacman game in python using pygame. I took the resulting code from these tutorials and added several enhancements. Unfortunately I haven’t had enough time to continue with the code, so hopefully this code is of use to someone learning python to play with and further enhance (Who knows might end up feature complete!). 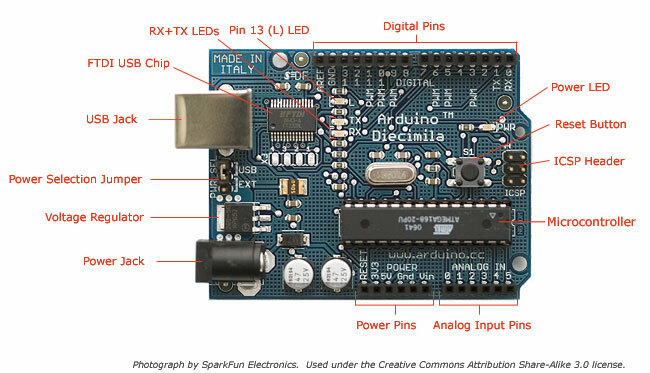 So what is an arduino? An arduino is an open source open hardware programmable controller with several inputs and outputs. The image below shows an Ardunio Dicemella. It (Arduino Dicemella) has 14 digital input/output pins (of which 6 can be used as PWM outputs), 6 analog inputs, a 16 MHz crystal oscillator, a USB connection, a power jack, an ICSP header, and a reset button. It contains everything needed to support the microcontroller; simply connect it to a computer with a USB cable or power it with a AC-to-DC adapter or battery to get started. They are very useful for people who know how to program but have little experience with hardware interaction. This post will not contain in-depth detail on how to program the arduino, instead focussing briefly on setting up serial (over serial or usb cable) communications in order to talk to a python script. 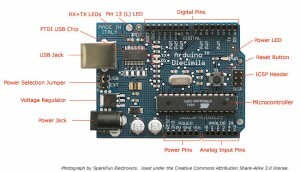 The arduino can be programmed via a IDE provided by the creators in a C-style hardware language. We now add into this code the ability to receive information via serial. Below is the modified example which removes the action of the button and replaces it by activating the LED when ‘Y’ is sent via serial. 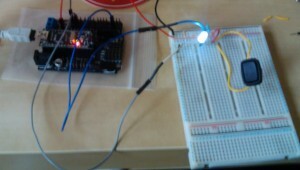 First we import the serial library to python in order to communicate with the arduino (this includes talking over usb). We then attempt to connect to our arduino on /dev/ttyUSB0, using try and except to catch an exception if we are unable to find the arduino on USB0. The 9600 corresponds to the baud rate (speed of communication) that we are using with the arduino and should be the same as set in the program on the arduino otherwise your communication may appear garbled. print "Failed to connect on /dev/ttyUSB0"
You may need to be careful as other devices can be connected. For example if I try to connect to /dev/ttyS0 I will connect to the wacom tablet on my laptop. Once you have connected to your arduino successfully you can write information to it using write and read information sent from it using read (you will need to import time to use the sleep function). If your arduino does not send any messages via serial then attempting to readline will result in your program hanging until it receives a message. So the python code should now look like the following and we should be able to control the LED over serial. The above will send the character ‘Y’ (Y for Yes please turn on the LED) to the arduino wait for 1 second and then read from the arduino which will have hopefully posted a response to our ‘Y’. Using the program on this should turn the LED on, and report LED Activated back via serial to our python program. This should be enough for people to get started with ardunios and communicating with them in python. 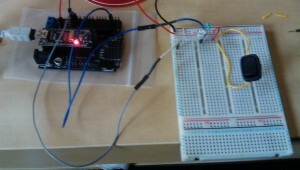 Python port of arduino-serial.c – By John Wiseman from which I based my program. original arduino-serial.c – by Tod E. Kurt. Dealextreme – Hong Kong based retailer that sells a lot of cheap DIY electronics and also has worldwide free delivery with no min spend (crazy). Does take about two weeks to arrive though (uk).